I was told that... A new year is like a blank book, the pen is in your hands. It is your chance to write a beautiful story for yourself. Does this means a new year means a new me or you plus more beautiful stories? Little Thumbs Up will be having a short break for January 2016 and Sharon from Sweet Home-Chefs will be the next hostess of Little Thumbs Up for February 2016 and her theme is Chrysanthemum and edible flowers. Yen from GoodyFoodies, Diana from The Domestic Goddess Wannabe and I are cooking and baking lots for Cook and Celebrate: Chinese New Year 2016 from 15th Jan to 23rd Feb 2016. Joyce from Kitchen Flavours, Lena Frozen Wings and I are continuing our bake-along and we will continue to bake lots with selected themes and recipes. Please cook, bake and blog along with us. For the usual me, I like to continue to run, cook and bake like crazy! For a slightly new me, I like to explore more and be more creative. For the past weeks, I have been enjoying creating fun-looking food for my Instagram lately. If you are a Instagram user, appreciate if you can support by visiting me at @zoebakeforhappykids. Besides Instagram, I'm so into superfood these days and like to incorporate more superfood into the my daily eating. 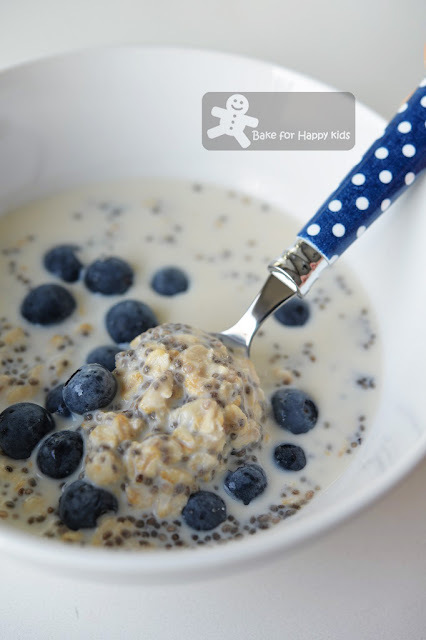 And this blueberry chia overnight oats is what I have been eating for my everyday summer breakfast. 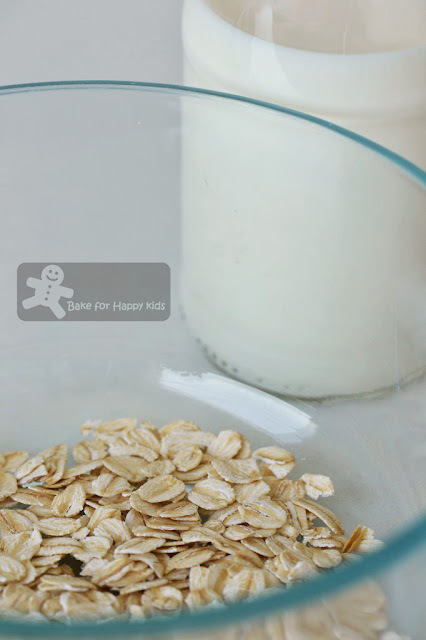 If you are a food blogger or read food blogs regularly, I'm sure that this overnight oat breakfast is nothing new to you as many bloggers have been raving about this fantastic breakkie idea. Here, I have learnt from the book, Superfoods 24/7 by Jessica Nadel that I can enhance a bowl of simple overnight oats to the next level... By adding two extra super food (chia seeds and maca powder) into my overnight oats, I have made this overnight oats double-extra super good! According to Wikipedia, superfood is a marketing term used to describe foods with supposed health benefits! "It must be one of the diet fads" said my always logically-thinking husband. Unlike my skeptical husband, the open minded me prefer to take a neutral stand towards superfood as I strongly believe some foods are truly nutritionally good for you! Having said that, I'm not saying that super food can cure all diseases or make us invincible or immortal... LOL! I like to eat food that makes us feel energized and happy. You know... Foods that help us to maintain our bodies and make us glow. That's all! Then, I ask myself... Which food is super and which is not? I'm sure many of us will have different opinions on superfood as some of us believe that some particular super foods can clearly show signs of health benefits while some don't. I'm not a health professional or dietitian and prefer not to vouch or guarantee the identity of any superfood. According to this vegan book, foods that are rich in macro-nutrients (proteins, fats and carbohydrates), micro-nutrients (vitamins, minerals and dietary fiber) and diseases-preventing antioxidants can be classified as superfood as Jessie, the author of this book, a Canadian passionate foodie, food blogger and a bakery owner has clearly emphasise that she would rather eat her vitamins in nutritious fresh food than in pills form. 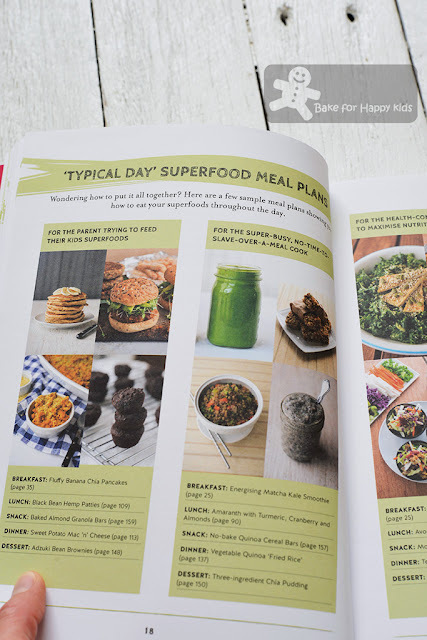 For this reason, this well-intended book is written with more than 100 quick and easy vegan recipes making sure that we can easily incorporate super foods into our everyday food. Absolutely no excuse at all for me and you for not eating superfood? LOL! 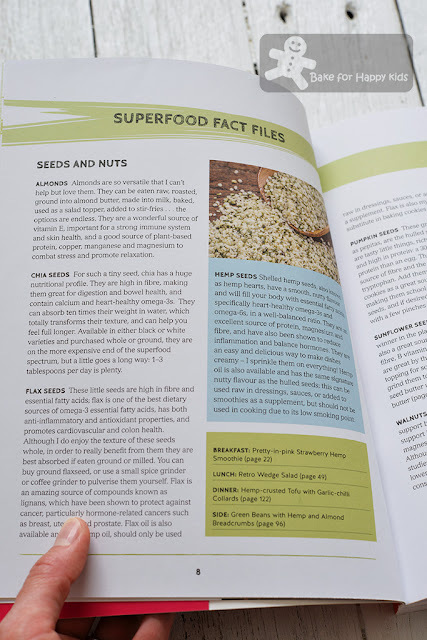 The beginning of the book has shown a list of plant based vegan superfoods describing why these foods are super and good. The book says that oats can lower cholesterol and control blood pressure. They are high in starch compound called beta-glucan that helps to stimulate the immune system. Great! So let's make more overnight oats for our breakfast!!! First, mix 30g rolled oats (not instant type), 1 tbsp chia seeds and 1 tsp maca powder in a bowl. Maca is a root plant native to the Andes of Peru and is said to be able to energize and improve fertility with wide-ranging benefits to the hormonal system. In dry powder form, it is actually quite delicious with a subtle nutty taste. Well... no harm trying! Since the discovery of this recipe, I have been eating maca powder for the past one month but can't really confirm if I'm extra energize or not! My son always says "Mum, I don't understand how you can run so much without stopping." I know. With or without maca powder, I still run like crazy and can't tell if maca powder is truly effective or not. Well, all I can say is maca powder is nutty and yummy... LOL! Add 200ml almond milk (or dairy milk if you are not a vegan). 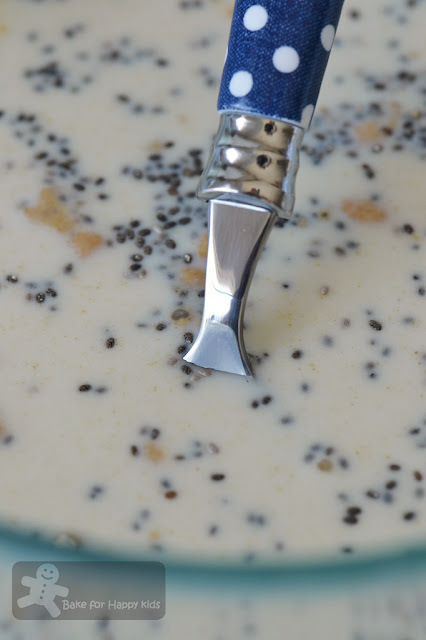 Stir and set aside in the fridge for at least an hour or ideally overnight. 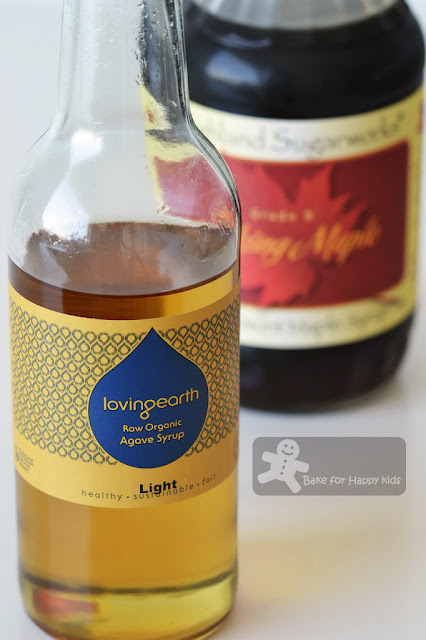 Before enjoying it, add 1/2-1 tsp agave syrup or maple syrup to taste. Then fold in about 30g fresh blueberries and sprinkle 1/8 tsp ground cinnamon (optional). Love this super good breakkie!!! 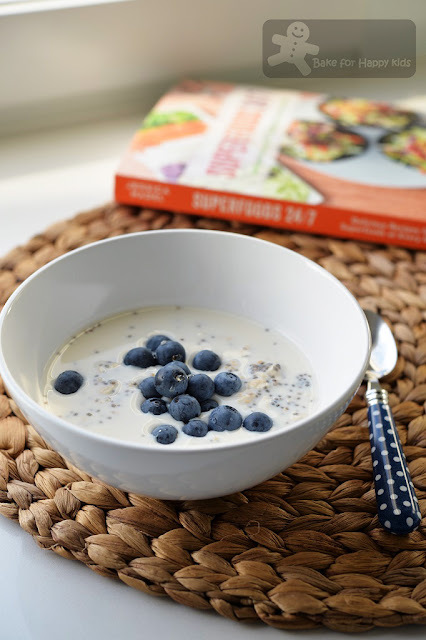 Want more superfood for a new day and a new year? 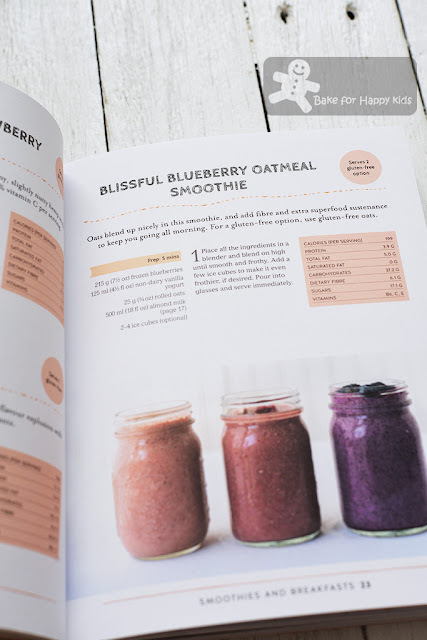 There are eleven very different smoothie recipes in this book and they are made with spectrum of natural vibrant colours and ingredients to ensure you and me feeling well-charged in every morning!!! Who says we can't have biscuits for breakfast? I would love to try baking these orange cacao-chips biscuits for breakfast as cocao nibs are known to contain mood-enhancing chemicals, mega magnesium and iron. Who says we can't have superfood everyday? It even mixes-and-matches breakfast, lunch, snack, dinner and deserts for people with different everyday expectation. 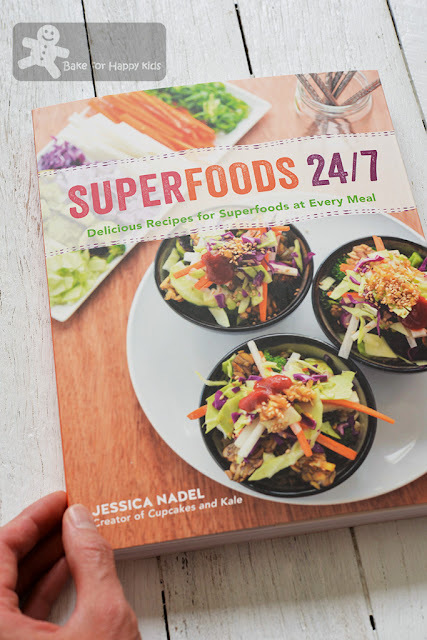 Can't have enough of superfood? I can't wait to show you more superfood in my subsequent post... I'm very impressed that this book has an endless choice of vegan recipes ranging from salad, soups, snacks, mains to desserts and cakes... And they are all super and superb!!! I hope that you will eat well and be happy for 2016!!! If you really like this book, you will be happy to know that this book is released on yesterday (4th Jan 2016) in most retail or online book shops at the retail price of AUD$29.99. I wish you have an even better year than all the past years in 2016. Keep on baking and sharing with us in your blog, you stay beautiful. Yay..! I can't believe it will be my turn soon! I learn a lot of you. Where did u buy the book from? This book is given by the publisher and it is released now for sales. You can search Google with the name of this book and you will find them selling in many online shops if you can't find a copy in your local bookshop. Cheers! I'm with you to kick start the new year / brekkie with some healthy overnight oats! it looks amazing...love overnight oats..
Hi Zoe, I have heard so much about overnight oats but yet to try. I am going to try this soon ... thanks for reminding me. Happy New Year! Nice to hear from you. 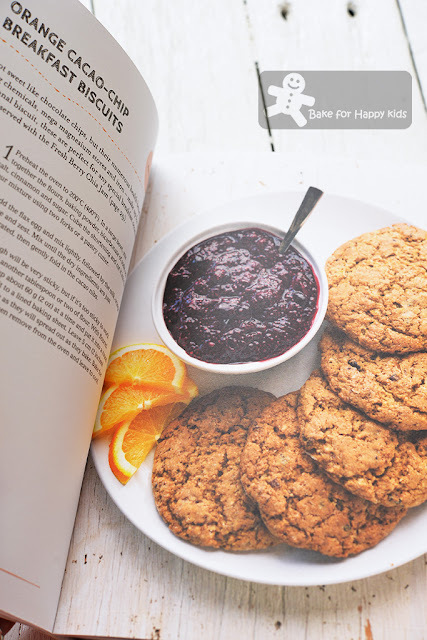 Your book is awesome and we love your recipes :D Yeah... We will love try more of your recipes. Where do you get the Maca powder from? 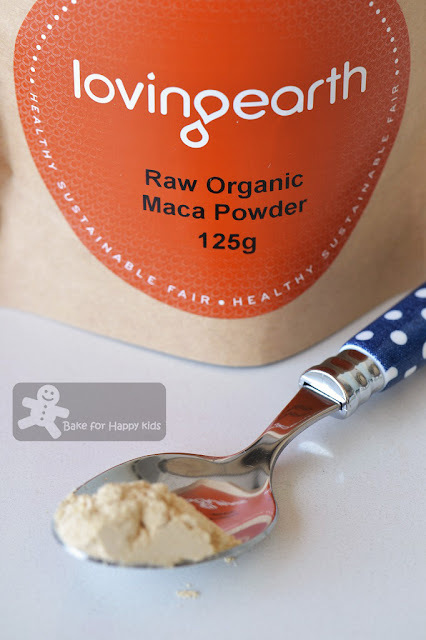 Hi, Maca powder is commonly available in most Woolies and Coles at their health food section. Or you can buy them from any health food shops or online. Cheers!